Lovely three bedroom family friendly villa on the south west coast of Corfu situated in beautiful gardens with a large private swimming pool, playground, tennis courts. Restaurants and bars nearby. In one of the most beautiful islands of Greece, surrounded by a lush estate of treesand flowers, you will find Villa corfu Maxim . 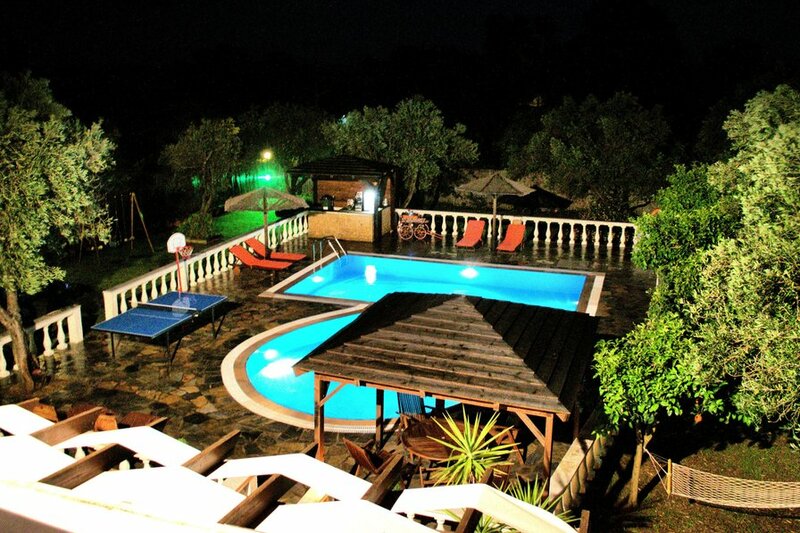 The villa is situated on the southwestern coast of Corfu, one of the most pristine and wild beaches of the island , protected by "Natura", the beach Chalikouna. There you can enjoy the bond of the sea to the lake with salt water, the lake of Korission. In the villa corfu maxim will enjoy the comfort and tranquility in your vacation, at 2 levels of modern and neoclassical premises. It can accommodate 6 people , since it includes 3 bedrooms, 3 WC, 2 living rooms. In the grounds of the villa, you will enjoy the 70 m pool while Barbeque will offer you an enjoyable culinary delights, as your children could spend pleasant hours in small playground . You will find several restaurants near the villa and 2 Beach Bars on the wild beach of Halikouna with nice music and facilities, while around are several wild beaches . Approximately 3 kilometers is located the village of Saint Matthew , where you will find 2 Super Market, Pharmacy, Cafe, playground. Above the village, over a distance of 3 km, is the mountain Pantokatoras, with an old and famous monastery .From there, you can enjoy unique breathtaking views. Also nearby, about 4 kilometers, is the seaside village of Moraitika , where you can visit the Night Clubs and many shops, for your shopping .